Facebook is the number one social networking site in India and as such, the top brands are using it to increase their market reach. However, the mobile brands are clearly dominating the Indian Facebook market space. 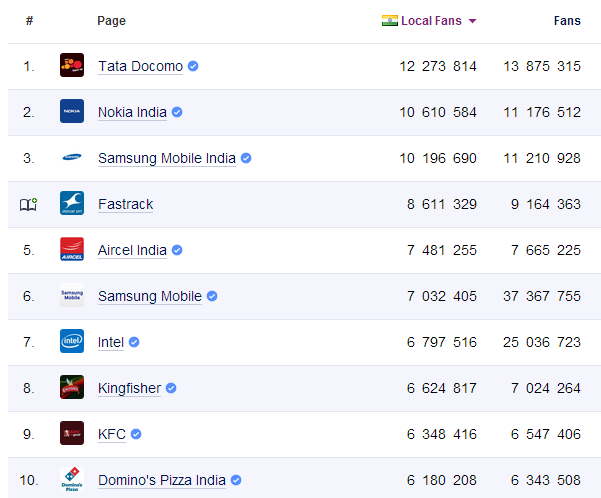 Top brands like Tata Docomo, Nokia and Aircel have the maximum number of Facebook fans on their pages. The table below lists the top 10 brands and the total number of local Indian fans and also the global fans that they are having. Tata Docomo leads the list with 12268874 Indian fans while the other top 4 are Nokia India, Samsung Mobile India, Fastrack and Aircel India.